I pinwheeled the Sea Ray 500 Sundancer in a sunny little lagoon, preparing to back the big express cruiser into a concrete-sided slip overhung with a giant, blue TraveLift. A breeze blew straight off the docks of the Sykes Creek Plant in Merritt Island, Florida, the spot where Sea Ray builds most of its larger vessels. It was a mild zephyr, but emphatic enough to lift a flag or two on the numerous other Sea Rays in slips nearby. I figured it would facilitate the process of backing down. Of course, I was smiling the faint smile of the true boat nut, which is not unlike the faint smile of the Mona Lisa. There&apos;s just something mysteriously delightful about maneuvering a big, gutsy, well-mannered boat around a dock, making her do precisely what you want. I shot a glance ahead, through the tall, frameless Taylor Made windshield. With a couple of feet to spare, the Sundancer&apos;s bow pulpit was sweeping crisply past the mangroves on the far side of the lagoon. I returned my attention to the stern, which was easily visible from my perch on the flip-up bolster that&apos;s part of the adjustable helm seat. The large, hydraulic swim platform back there was clearing an abutment nicely, again with a few feet to spare. Less is more, when it comes to boathandling. I pulled both 635-hp Cummins MerCruiser QSM11s out of gear, noting with satisfaction that the Teleflex shifters were savvily positioned on the port side of the wheel, where I could easily work them with my right hand while facing astern. Dealing with the throttles on the other side of the wheel was totally unnecessary, by the way, due to the size of the props and the idle-speed torque of the powerplants. The boat continued to pinwheel under the influence of her displacement, gradually assuming a catty-cornered position. I clicked the starboard shifter astern momentarily, which stalled the pinwheel effect, pulled the right-hand corner of the transom slowly back into the slip, and began moving the bow to starboard, toward a fingerpier where we needed to tie up. 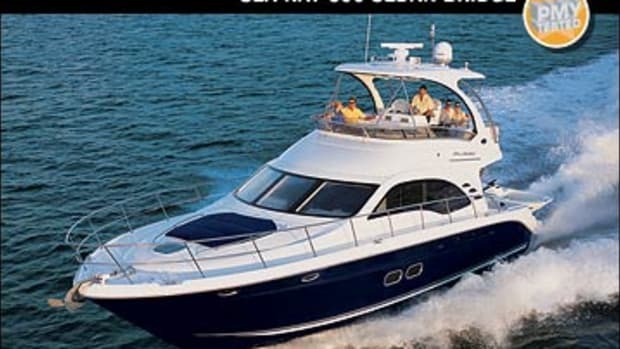 After a bit, I gave the powerful, 24-volt MaxPower thruster a couple of shots to accelerate the movement of the bow and watched appreciatively as the big cruiser settled into the slip precisely where she needed to be. A guy in a Sea Ray T-shirt came strolling up, took the outboard stern line, and figure-eighted it on a cleat on the pier. "Good job," he winked, moving forward. The remark pretty much summarized the opinion I&apos;d formed during the past couple of hours of sea-trialing the 500 in the nearby Indian River. Sightlines forward while coming out of the hole were unobstructed--I didn&apos;t even need to lift my chin to see clearly over the bow. 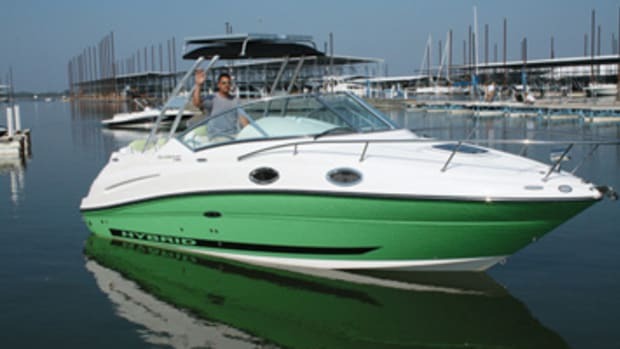 Turns were smooth and effortless--I found I could spin the wheel at all times with just one finger, thanks to Teleflex SeaStar hydraulics and engine-driven power-assist. 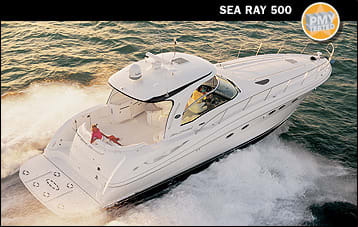 And the Sea Ray Navigator, an optional, dashboard-mounted PC plotter with a daylight-viewable touch screen that is truly daylight-viewable, showed its stuff with flair. All I had to do to set a waypoint and automatically steer towards it was gently poke the screen with a finger and then push the little orange button on the autopilot. I shut down the mains once all our lines were secured and, before moving on to more substantive matters, opted to dial up a little James Taylor for the stereophonic heck of it. Actually I should say a lot; the oomph inherent in the two entertainment systems onboard the 500 was literally stunning. At half-volume, the four waterproof speakers, amplifier, and subwoofer that serve the Clarion XM Series unit in the cockpit generated sound powerful enough to darn near blow my Flexons off. 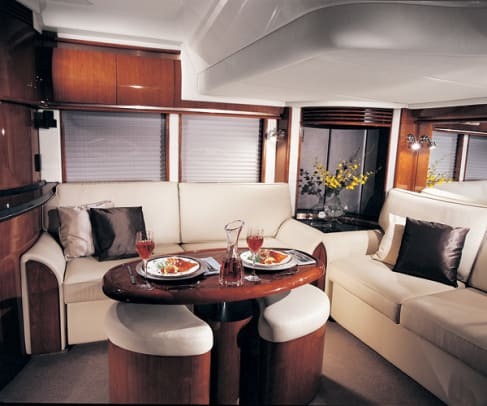 And below decks, the oomph was even oomphier, if such a thing&apos;s possible, thanks to an optional Bose Lifestyle 35 home entertainment system, which was ensconced in a cabinet on the port side of the saloon and enlivened by an Acoustimass subwoofer and seven strategically placed cube-type speakers. Took ol&apos; Sweet Baby James to a whole new level, trust me! The rest of our test boat&apos;s interior was as impressive as its thunderous entertainment package, which I eventually had to turn off so I could concentrate. A high level of finish distinguishes the express-style layout, with its master stateroom forward, full-beam saloon aft, and two heads, guest stateroom, and galley between. Cherry veneers on bulkheads were precisely routered around openings for cabinets, bins, and drawers. Seams between different structural and/or cosmetic materials, whether solid cherry moldings, Corian countertops, gelcoated fiberglass, or marine-vinyl-upholstered overhead panels, were crisp and die-straight. And the bilge, which can be easily accessed via a number of hatches throughout the interior, was immaculate—no rough, unpainted edges anywhere. A few especially sensible features caught my eye. For starters there are large, stand-up shower stalls in both heads. Moreover, besides a top-of-the-line VacuFlush MSD, each head has a frosted, opening port and an electric vent. Then there&apos;s the SeaTech water manifold, which I accessed through a hatch in the cabin sole near the galley. It&apos;s color-coded and numbered valves make it possible to shut down a part of the system for repairs without shutting it all down. Convenience and safety in one nifty package! And finally, I noted a whopping array of drawers and stowage bins in the galley. Flatware, dishes, pots and pans, canned goods, cleaning supplies…there&apos;s a spot for everything. I finished up my day onboard the 500 with a tour of the engine room, which I entered via a chrome-plated steel ladder and a hatch in the cockpit. The place offers stoop-type headroom to a person of average height and is logically laid out, expansive, and sweetly outfitted. Whether I was scrutinizing the Marine Air air-conditioning compressors, the 13.5-kW Onan genset (with soundshield), the batteries (two 8D Lifeline AGM cranking types and two Group 27s for house usage), or the V-drive mains themselves, all machinery and equipage was installed in solid, serviceable fashion. Sea Ray even added brackets for the spanner wrenches that fit the two Groco main-engine sea strainers—keeps the little jewels from getting lost. About sunset, I realized I&apos;d had so much fun testing Sea Ray&apos;s new 500 Sundancer during the day that I&apos;d forgotten to eat anything since breakfast. So not long after departing Sykes Creek for the Orlando airport in my rental car, I hit a restaurant in Merritt Island for take-out, a spot I&apos;ve been visiting for years. Although the name of the place changes periodically—most recently from Fat Boy&apos;s to Island BBQ—it&apos;s my experience that the quality of the chopped-pork sandwich here remains steadfastly high, a tribute to talented people who consistently turn out a great product. A fitting metaphor for the day? Considering the Mona Lisa delight I&apos;d experienced running the 500 that morning, and all the high-quality craftsmanship and equipage I&apos;d examined onboard during the afternoon?